PC Adrian Goldsmith, aged 50- known as Otis - is accused of killing his wife Jill, 49, in the porch of their home next to Wootton Hall police headquarters in Northampton on March 26 last year. 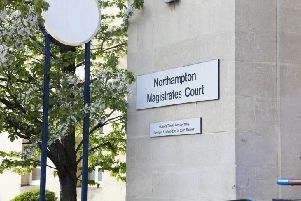 A jury at Stafford Crown Court heard Goldsmith was assigned to Northamptonshire Police’s Command Support Centre in December 2012 where he was put on restricted duties - while still serving as a Detective Constable - pending the outcome of his misconduct investigation. The court heard that in September 2013 he was given a formal warning for misconduct. Days after receiving his warning Goldsmith signed off work with stress between September 2013 and March 2014. During his time in the support centre he had a falling out with another colleague - who was also a neighbour in Wootton Hall Park - PC Stephen Dunn. PC Dunn complained to his superiors in August 2013 about a boundary dispute, claiming Goldsmith had cut back a hedge without planning permission. He also reported that he had been arguing with Goldsmith about Jill’s son who he claimed woke him up in the mornings with his excessively loud car exhaust. On his return to work, Goldsmith was offered a role as a fraud investigator but two days after joining he received an email saying the unit was to be disbanded. He went off sick again in July 2014 until November 2014 when he returned to work with the Demand Management Team at Force HQ - where he was still stationed at the time of his arrest. Sergeant Matthew Slinn, who was Goldsmith’s supervisor at the Command Support Centre, told the court Goldsmith’s argument with PC Dunn created an “awkward” atmosphere. He said: “There was a planning dispute between the two which had been going on for a while. Absolutely, it made things awkward. “But there was a radical reduction in staffing in the fraud team (and the unit was forced to close). “To say this was an unfortunate is a huge understatement. It led him to being unhappy and distressed. “It was clear that he was of the view that he had been brought back to work under false pretences. We didn’t often take drastically opposing views but on this we did. “I had been informed very clearly that on his return he would be posted to working on fraud. “We got on well together. I tried to help him and his family and he told me he was grateful for my support. “He was proud of his professional abilities and his service and did believe he was good at what he did. I had absolutely no evidence to suggest otherwise. The court heard Goldsmith rejected several offers of occupational therapy after telling Sgt Slinn of his domestic problems with his wife. Sgt Slinn added: “I felt like he was protective of her (Jill). “He was a man who, in my view did wear his heart on his sleeve, more so than other police officers. But his work under me was exceptional. “He told me on numerous occasions that Jill wasn’t well. I told him I would do whatever I could to help him and her. “I bumped into him at police HQ in February last year and it seemed to me like Otis had returned to being Otis. The court also heard Goldsmith has five children in total - from two previous relationships. Goldsmith denies a charge of murder. The trial continues.